This article was published two weeks ago on StartUp San Diego's blog. I figured you guys might enjoy so I'm reposting it here. Sunshine and Navy SEALs. Craft beer and mobile chipsets. Biotech and retirement homes. Surfer mecca and research haven. San Diego is a city packed with contradiction. As it happens, these contrasts are also the region’s greatest strength. GroundMetrics Inc. is one of the fastest growing startups in the region. 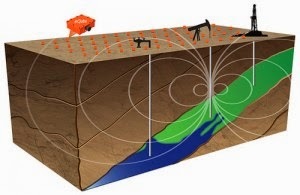 They have developed a new kind of electromagnetic sensor system that captures high fidelity geological data. They use these sensors to run surveys for oil and gas companies. It’s almost like an MRI for rocks. Illustration of a GroundMetrics' survey. Many look to the San Francisco Bay Area as the gravitational center of the startup world. But technological and business innovations are emerging in many places you might not think to look. Boulder, CO has seen a flush of new tech startup success. Last week, Twitter acquired long-time Boulder social data startup Gnip. San Diego is earning its reputation based on being a little different. GroundMetrics is now the world leader in ground-based electromagnetic sensors. Oberon Fuels is rethinking transportation with its clean-burning, low-cost dimethyl ether fuel. Kapyon Ventures is changing agricultural biotech and Correlation Ventures is doing venture capital differently. “Like San Diego, our team prides ourselves on being unconventional,” says George. “We’ve uncovered great opportunities and developed incredible inventions by challenging conventional wisdom. Many of Malcolm Gladwell’s books challenge conventional wisdom. Data displaces assumption. So many experts have told us what we’re doing is impossible. Then their jaws drop when they see our technology in action. Diversity is a key ingredient for innovation. As it happens, diversity is one of San Diego’s greatest assets. Home of companies from Qualcomm to Petco, the region has a cross-section of high performers that are now shaping the next generation of American companies. That is, as long as they continue to cultivate unconventional wisdom.